This article is about the United States based bank. For the Canadian parent company, see Toronto-Dominion Bank. Cherry Hill, New Jersey, U.S.
Connecticut, Delaware, Florida, Maine, Maryland, Massachusetts, New Hampshire, New Jersey, New York, North Carolina, Pennsylvania, Rhode Island, South Carolina, Vermont, Virginia, Washington, D.C.
TD Bank branch in Chinatown, Washington, D.C.
TD Bank, N.A., is an American national bank chartered and supervised by the federal Office of the Comptroller of the Currency. TD Bank offers banking, insurance, brokerage, and investment banking services in Connecticut, Delaware, Florida, Maine, Maryland, Massachusetts, New Hampshire, New Jersey, New York, North Carolina, Pennsylvania, Rhode Island, South Carolina, Vermont, Virginia, and Washington, D.C. The bank is a successor to the Portland Savings Bank, which started in Portland, Maine, in 1852, and later became Banknorth. The bank took its current name, TD Bank, N.A., in 2008, through the acquisition and renaming of Commerce Bank and its subsequent merger with TD Banknorth. In 2013, TD Bank, N.A. centralized its headquarters in Cherry Hill, New Jersey, U.S. The company is a subsidiary of the Canadian multinational Toronto-Dominion Bank based in Toronto, Ontario. The bank's "TD" initials, first popularized in Canada, are used officially for all American operations. The bank embraces a retail approach to banking; its branches are called "stores" and have extended operation hours. 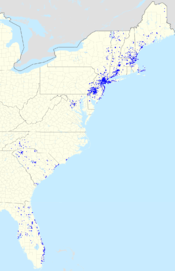 On May 10, 2000—after various mergers and acquisitions—Banknorth Group Inc. of Portland, Maine ("Banknorth") came into being, as a holding company for banking and insurance activities, primarily serving the New England area of the United States. On December 31, 2001, Banknorth Group, Inc., merged its seven subsidiary banks into one bank— Banknorth NA—under the Peoples Heritage Bank charter dating back to 1852, with one OCC charter. In August 2004, Toronto-Dominion Bank—which operates as TD Bank Financial Group—became the majority owner, renaming it "TD Banknorth, N.A." In connection with the transaction, Banknorth changed its name to TD Banknorth Inc. and reincorporated in Delaware. In July, 2005, TD Banknorth announced that it had acquired Hudson United Bank, based in Mahwah, New Jersey. The acquisition expanded TD Banknorth’s presence in New York and extended the franchise into northern New Jersey and Philadelphia. In April 2006, TD Banknorth announced acquisition of Interchange Financial Services Corp., adding 30 branches in the New Jersey counties of Bergen and Essex. Banknorth added a sister company, TD Ameritrade, which was formed after the Ameritrade Holding Corporation acquired TD Waterhouse USA from Toronto-Dominion Bank in 2006. On November 20, 2006, TD Bank Financial Group (TDBFG) and TD Banknorth entered into an agreement in which TDBFG would acquire all remaining shares of TD Banknorth. This was completed on April 20, 2007, and TD Banknorth became a wholly owned subsidiary of TDBFG, with the bank's headquarters in Portland, Maine. On October 2, 2007, TDBFG and Commerce Bancorp, Inc. of New Jersey announced that they had signed a definitive agreement for TDBFG to acquire Commerce Bank in a 75% stock and 25% cash transaction valued at US$8.5 billion. Under the agreement, Commerce shareholders received 0.4142 shares of a TDBFG common share and US$10.50 in cash in exchange for each common share of Commerce Bancorp Inc. The consideration was negotiated on the basis of US$42.00 per share value for Commerce Bank. The transaction value, based on the October 1, 2007 closing price of TDBFG common shares, was $42.37. Following the completion of the transaction, TDBFG expected to take a one-time restructuring charge of approximately US$490 million pre-tax. The deal closed on March 31, 2008. Commerce Bank employees were given a welcome kit with 2 TD pins (to replace the previous "C" pin worn by staff), a small bag of green M&M's, and a brochure of the history of TDBFG. On March 20, 2008, the combined company announced it would be doing business in the United States as "TD Commerce Bank" after the merger. A TD Banknorth competitor, Commerce Bank & Trust Company, of Worcester, Massachusetts, filed a lawsuit against TD Banknorth, to bar the bank from using the name TD Commerce Bank in its existing Massachusetts branches. On May 2, 2008, federal Judge F. Dennis Saylor granted a preliminary injunction, prohibiting the use of the TD Commerce name in Massachusetts branches. As a result, TDBFG decided not to go forward with its original rebranding plans. Instead, it decided that the "Commerce Bank" name, red "C" logo, and red theme would be retired and the branches would carry the brand name "TD Bank," although the "America's Most Convenient Bank" tagline would remain (as was originally planned). All Commerce branches became TD Bank on October 31, 2008, after a slow phasing in of the TD name, logos, and colors in the branches. As of November 1, 2008, the Commerce Bank website redirected to the TD Bank website. At the same time, Toronto-Dominion also rebranded many of the TD Banknorth branches in the Commerce business areas as TD Bank, while closing several branches that overlapped with Commerce branches in the same area. In the TD Banknorth bank region, the rebranding occurred in September 2009, which completed the merger of the two banks under the TD Bank brand name. On May 17, 2010, TDBFG announced the purchase of The South Financial Group, based in Greenville, South Carolina, for $192 million. The South Financial Group owned Carolina First in North and South Carolina and Mercantile Bank in Florida. The transaction added 176 locations to TD Bank's branch network in the Southeastern United States and expanded TD's footprint to include North Carolina and South Carolina. Both banks operated under their existing names as trade names of TD Bank, N.A., pending the completion of the deal. Shareholders of The South Financial Group were to receive $61 million in cash, while the U.S. Treasury would receive $131 million. The deal, approved by The South Financial Group shareholders September 28, 2010, was expected to mean a $216 million loss to taxpayers, since the company received $347 million in bailout money. On September 30, 2010, TD Bank Group completed the acquisition and merged Carolina First Bank and Mercantile Bank with TD Bank, N.A. The re-branding of branches occurred in June 2011. On December 21, 2010, it was announced that TDBFG would purchase Chrysler Financial. The unit would later operate under the name TD Auto Finance. In October 2012, TD Bank notified approximately 267,000 of their customers that the company may have been affected by a data breach regarding unencrypted backup data tapes that were misplaced in their transportation earlier in March. Regis Philbin and Kelly Ripa appeared in TV commercials prior to 2011, starting with the change from Commerce Bank in 2008. With Philbin announcing his retirement, it was possible these commercials would end. A TD spokesperson said, "Regis and Kelly have been great ambassadors for us over the years." The bank introduced its new mascot— an anthropomorphic green trapezoid named “TD”—in June 2010, at the TD Bank Philadelphia International Cycling Championship. 1 2 Deirdre Fernandes (October 1, 2013). "TD Bank moves headquarters out of Maine - Takes base to N.J. after expansion south". The Boston Globe. Retrieved March 22, 2015. New Headquarters: Exclusively in Cherry Hill, N.J.; previously split between the New Jersey office and Portland, Maine. ↑ . TD Bank website. Retrieved 2015-03-19. 1 2 3 4 5 Company History. TD Bank, N.A., website. Retrieved on 2010-08-30. ↑ "TD Bank Financial Group to Acquire Commerce Bancorp Inc.". TD Bank. 2007-10-02. ↑ Kerber, Ross (2008-04-01). "Commerce Bank & Trust sues to guard Mass. identity". The Boston Globe. Retrieved 2008-04-05. ↑ Eckelbecker, Lisa (2008-05-03). "Commerce Bank wins first round". Worcester Telegram & Gazette. Retrieved 2008-05-03. ↑ "TD bank of Canada buying SC-based South Financial", The Sun News, 2010-05-18. ↑ O'Daniel, Adam (May 17, 2010). "TD Financial Buys South Carolina's South Financial Group". Charlotte Business Journal (American City Business Journals, Inc.). Retrieved 2010-07-11. ↑ "Makeovers free for unemployed in Myrtle Beach". The Sun News. 2010-09-29. Retrieved 2010-09-29. ↑ "Canada's TD Bank bets $6 billion on U.S. auto lending". Reuters. 2010-12-22. Retrieved November 9, 2011. ↑ Wallack, Todd. "TD Bank data breach affects 267,000 customers, including 73,000 in Massachusetts". The Boston Globe. Retrieved October 13, 2012. 1 2 "TD Bank mulls its options as its spokesman Regis Philbin quits talk show". International Business Times. 2011-01-24. Retrieved 2011-07-11. ↑ "Regis pitches TD rebrand". Toronto Star. The Canadian Press. 2008-11-01. Retrieved 2011-08-18. ↑ Blumenthal, Jeff (June 16, 2010). "TD mascot sporty, fun and 'strains intellectual scrutiny'". Philadelphia Business Journal. Retrieved 2010-12-29. Riley, Clint (May 21, 2003). "Fast-Growing Commerce Bancorp Counts On Political Ties". KRTBN Knight-Ridder Tribune Business News: Hackensack Record (on New York University (NYU) Leonard N. Stern School of Business website). Retrieved 2010-08-30.